Harry's Code was crafted by Harry Clark as a rocking melting pot of musical influences and life experiences. “In the color wheel” is the band's first album and “Freennocent” its debut single, fresh oil painting that runs through the entire record. Harry Clark created Harry's Code in 2012, after many years playing and composing for several bands. HC's was crafted by Harry Clark as a rocking melting pot of musical influences and life experiences. "In the color wheel" is his first album, to be released during summer 2016. Each song is a different story, a different atmosphere, and was created with an independent mind-set and music style. All of these songs wrung the oil painting for Harry's blank canvas. Harry Clark composed all the music and arrangements, played all instruments and voices and recorded, mixed and mastered all songs. The lines of his code were written by means of Classical guitars, 12 & 6 String Acoustic guitars, Gibson and Ibanez electric guitars, Roland keyboards, ESP LTD basses, among others. 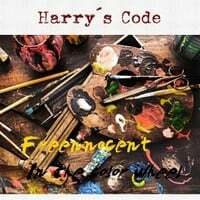 I hope you will all enjoy this album as much as I did during the lengthy process of discovering which are my rules and my dreams, the Harry's Code. For the time being, "Freennocent" will offer you a glimpse of my universe.